Once you’ve completed your action plan, it’s essential to set up regular review mechanisms. In fact, following up on the plan is critical to success as it is the means by which you ensure the organization delivers on its commitments. And the stakes are high. Staff members will be closely watching your progress and will be keen to see some real action rather than simply paying lip service to the notion of employee engagement. The organization’s credibility is on the line. Review mechanisms will help you to monitor progress and deliver on your promises. 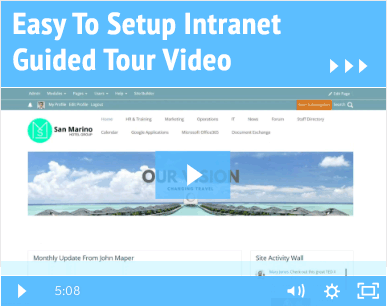 And when it comes to drawing up an employee engagement action plan and disseminating it throughout the business, an intranet is an indispensable tool. Whether it’s to publicize, inform, communicate or invite feedback, the intranet is the perfect platform as it is accessible to all staff who use it on a daily basis to get their work done. Organizations can no longer afford to ignore the issue of employee engagement. The time to act really is now or you run the risk of falling behind the competition. Use the ideas in this article to set the ball rolling in your company. MyHub provides intranet solutions to many businesses across the globe just like yours. And so if you would like an informal discussion about employee engagement and how an intranet can support your efforts, then get in touch today. Better still, why not take advantage of our no-obligation demo or 14-day free trial and see for yourself just what a difference an intranet can make to your business.